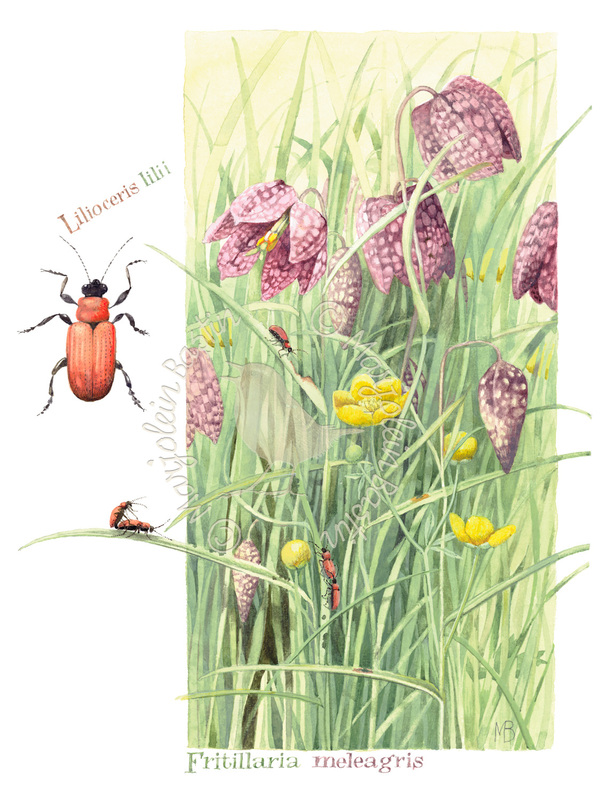 For years I knew the Snake’s head fritillary only from my books about wild plants. Rare, found in only a few places. But then it started appearing at nurseries and bulb-catalogs! Suitable for moist, rich soil. It was planted by my pond in the Netherlands a day later. Then all of a sudden this pretty little red beetle appeared. At first I was excited about having a new species in the garden. I had to look him up in my books, it turned out to be a Scarlet lily beetle. One of the leaf beetles. And don’t even bother trying to catch them, they intentionally drop to the ground with their black undersides pointing up so you can’t see them. Their larvae followed a few weeks later. The brown larvae are quite repulsive, they smear their feces on their back as camouflage. There isn’t another creature on earth that would consider eating them. The larvae actually eat more than their parents. If you like your fritillary more than these beetles there’s only one thing to do: get on your knees and try and catch as many as you can.